Are you on the right trail for small business success? Finding your path to small business success doesn’t necessarily come from doing what you’re supposed to do. Sometimes, you need to put platitudes aside and forget about ‘standing on the shoulders of giants,’ ‘following the path forged before you’ and ‘not reinventing the wheel,’ as you strive to discover what works for you. Just because breeding or schooling or experience or opportunities point in a particular direction, it doesn’t mean you’re wrong to let your passion take you elsewhere. Business should be fun. If it doesn’t feel like play, consider a different course. Once you’ve decided on a direction, though, it’s important to clue others in to the ground rules, know what you’re vying for and set limits on how long you’ll spend following a path that’s leading you in the wrong direction. •	Make up your own rules or follow someone else’s playbook, but make sure your customers, referral agents and support team understand the game you’ve devised. You can’t succeed in business alone. Giving others what they need to help you succeed can mean the difference between triumph and defeat. •	Planning is important no matter what job you decide to invent. If you don’t have a clear view of where you want to get with milestones along the way to ensure you’re still on course, it’s going to be tough to create a successful small business. This doesn’t mean you can’t alter course along the way – that’s the great thing about thinking about the trip ahead of time – you’ll know when you’re lost. •	Quitting time might be the most important thing you settle on before you begin. Most new small business owners give up too early. Two years is a good amount of time to plan on for referrals to start providing enough client work to keep you busy and profitable. It’s also prudent, however, to set reasonable goals to meet as you strive for small business success. There’s nothing wrong with regrouping and starting in a new direction when you can’t convince others to buy what you’re offering. It’s not failing when you use your experiences to create a better plan for the future. 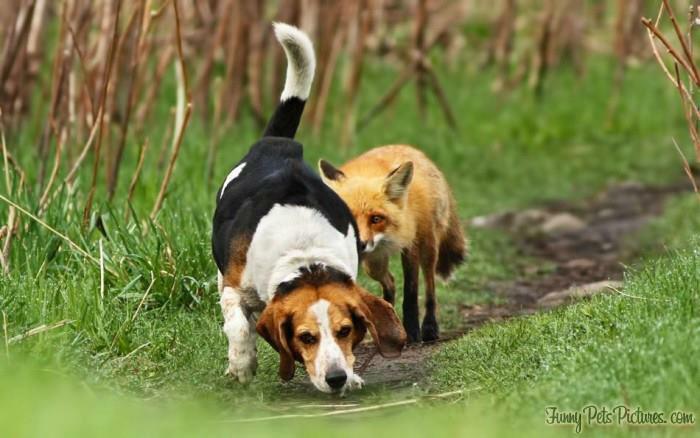 I laughed out loud when I saw this photo of a hound seemingly oblivious to his goal traipsing behind him. Sometimes it’s that simply – look around you to find what’s been so elusive. More often, though, we’ve chosen a career path that’s not right for us. Peer pressure, upbringing, bills, social status and family expectations can all lead us astray. If chasing your small business success isn’t making you happy, chances are you’re on the wrong path. Just because everyone says that’s what you’re supposed to do with your life, doesn’t make it so. Hope this New Year brings each of you insight for a wondrous and prosperous journey into 2013 and beyond. 6 Responses to Are you on the right trail for small business success? Wish I could give credit where due on this photo. It’s a gem! Yes, I hear you on reinventing the rules, Jan. I’ve been doing a bit of that myself. Reading some of your recent blog posts, it sounds like you have a good plan. It’s tough when your primary business functions are stymied by Goliaths you can’t control. I feel for you. Still, I know you’ll wind up victorious. You’re smart, savvy, dedicated and are filling a niche that’s sorely needed in the small business community. Count me among one of your raving fans. That photo is great. I’ve been in that position once or twice in my life in the past. You give solid advice in this post. My planning skills are good, however, I sometimes don’t use them to my advantage. I have a tendency to prefer to be spontaneous and have learned that it isn’t always the best way to be when running a business. I’m getting better at planning. Julia – thanks for stopping in, reading and commenting. Yes, that photo is priceless, isn’t it? Wish I could claim credit for it – or at least honor the creator with attribution (it was on a royalty free pet share site that doesn’t note the provider). I’ve been in that position too – more htan once or twice in my life :-). It’s funny you claim to be poor at planning. Seems to me from what I observe, you’re better than most. yes, i believe the important thing is to have fun and align your business with your values! Thanks for stopping in, reading and commenting, Janet. Nice to meet you. I enjoyed being introduced to your blog and left a comment. Keep the inspirational stories coming.